His past maimed him to the point of addiction. Dreams of distorted faces, horrid sounds and even smells, chased him to dysfunction. Vietnam took his youth and innocence. Combat orders haunted him, yet they kept him alive … he turned to alcohol for comfort. When I met him, he was a broken soul. He stayed busy, played hard, and worked even harder. He did anything to take away the memories that wrecked him. Today he is a decorated combat veteran. He’s one of the few that was shot up, but made it home in one piece. In 1990, over 21 years after he left Chu lai, Vietnam, he found Jesus, but only after years of heartache, loss, and destruction. We married in 1986 and it was a long 4 years before he found the Lord. We had a lot of hard times, a lot of tears. I didn’t have a clue how broken he was until he hit bottom. On a cool, St. Patrick’s Day evening, 1990, he walked the aisle and gave all his pain to the Lord. On the drive home from church … he spoke about finally feeling peace. ​The demons chasing him all those years were from guilt and condemnation. My Veteran now takes comfort in his God. A God who forgave the unforgivable, in his opinion. A God who is no longer angry with the years of destruction that led to a wasted life, divorce, and hopelessness. Oh beloved, God doesn’t withhold good when we do wrong. He does the exact opposite. He forgives. What have you done that feels unforgivable? What haunts you with condemnation and guilt? He is waiting to forgive … and comfort you … all you have to do is ask for forgiveness. 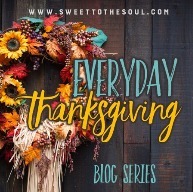 Let this Thanksgiving season be a time of repentance as well as praise. Let the Father lavish his love on all your broken places. 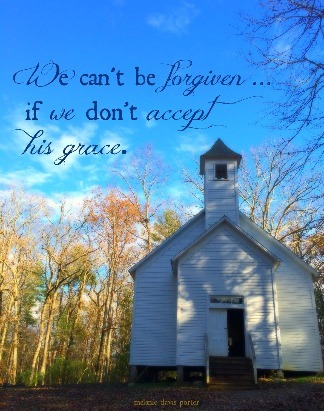 We can’t be forgiven … if we don’t accept His grace. Thank you God for loving us when we don’t deserve it, and giving us mercy when we need it most. Catch up with Melanie on her website at MelanieDavisPorter.com. This is absolutely beautiful, Melanie, and brought me to tears! Thank you for sharing! Thank you Crystal! God is so merciful! Amen! You speak truth...love you and your precious family! Beautiful, Melanie! What a story! Thanks for sharing!